Technical (tec) diving means going beyond recreational scuba diving limits. But, tec divers will tell you that it’s really about the challenge and adventure of exploring places that no one else has ever seen. 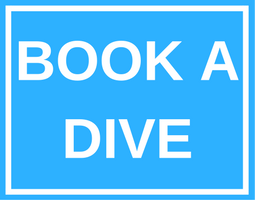 Tec diving is not for everyone, but it does attract experienced divers who want to go beyond their current limits and are willing to accept the added risks, training, investment and commitment it demands. If this is you, then PADI TecRec courses are your ticket to extreme adventure. In technical diving the surface is often inaccessible in an emergency, so tec divers use extensive procedures, equipment and training to manage the added risks and potential hazards. .
PADI TecRec courses are the quality benchmarks in the tec diving world due to their rigorous, yet logical, training sequence and the PADI educational materials that support them. 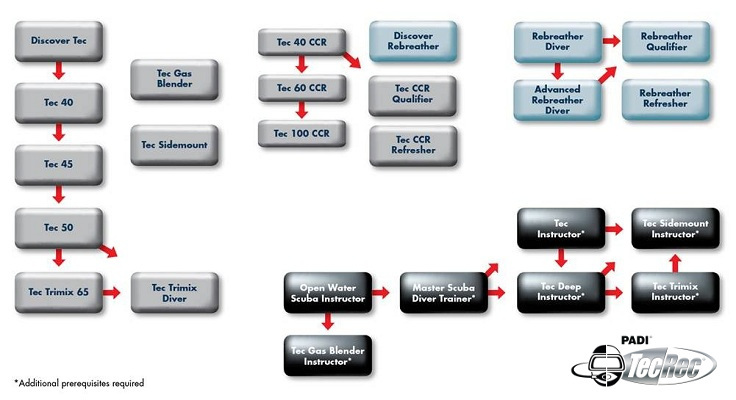 TecRec courses are instructionally valid and have a seamless course flow that takes you from a new tec diver to one qualified to dive to the outer reaches of sport diving. Each level introduces you to new gear and procedures to extend your dive limits. Many spectacular, untouched wrecks lie at depths well below 40 metres/130 feet. Deep reefs have organisms you don’t find in the shallows. Some people enjoy the challenge and focus tec diving requires. Still others love being involved with cutting edge technologies. These reasons make tec diving rewarding. However, you can be an accomplished, avid top-notch diver your entire life without making a tec dive. Tec diving does require significantly more effort, discipline and equipment, which means it’s not for everyone. Explorers have always developed new techniques and equipment to extend the range of their adventures, and divers are no different. By the early 1990s, several groups of divers around the world began experimenting with technologies for deep diving beyond recreational limits to explore both caves and wrecks. These communities united and emerged as “technical diving”. Since then, tec diving continues to develop both in scope and in its technologies.